14ymedio, Reinaldo Escobar, Havana, 14 September 2018 – High school students who aspire to enter the University to train as journalists will no longer have to demonstrate the high academic achievement required in the past. As of the next academic year, 2019-2020, simply passing the entrance exams and “aptitude test” will be sufficient, according to the official press. René Sánchez, Director of Admissions and Employment Placement for the Ministry of Higher Education (MES) confirmed in a press conference that the candidates for a place in journalism programs will be “selected by a rigorous process that demonstrates the necessary skills for this specialty and commitment with the best traditions of that profession in Cuba,” the so-called “aptitude test” that has existed for years. The parameters that will be measured in the aptitude tests are outlined in a note recently published by Adelante newspaper in the province of Camagüey that promotes “exchanges” identified as “vocational training spaces” organized by the Cuban Journalists Union (UPEC) where applicants to the profession can study to pass the aptitude tests. According to this provincial media the exchanges will take place from late September to mid-October in the Camagüey Press Center to train for three phases of the aptitude test called “general culture,” “writing and understanding” and “the interview,” with the understanding that the latter will not be the submission of a work of journalism, but an interview which the applicant will face to be accepted. The president of the National Journalism Careers Commission, Maribel Acosta, told this newspaper in a telephone interview that the aptitude tests will be what establishes acceptance into the journalism department, according to the plan of places awarded. “At the moment we are trying to clarify with the MES whether the aptitude tests are going to be centralized or decentralized,” Acosta added. In the latter case, each study center will hold its own exams, but if they continue to be centralized, they will be carried out by the Commission and will be the same day and at the same time throughout the country. When the new measure takes effects, students who apply will not have to obtain outstanding grades in the entrance exams or have a high grade point average accumulated in three years of high school. Over the last 30 years, the Bachelor of Journalism had been at the top of the pyramid of aspirations for university degrees, and for that reason and due to the ranking system based on the academic performance that has prevailed, only high school graduates with grades higher than 95 or 97 points could be admitted to this discipline, after having passed a supplemental proficiency test. “This faculty has been considered as a kind of elite to which only the brightest high school graduates are admitted. 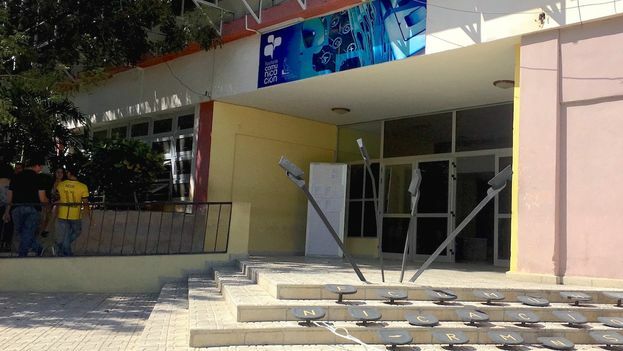 Now the most docile, the most ‘politically correct’ will enter and that will be good news for those who direct the press in this country,” a young student of the first year of the Faculty of Communication of the University of Havana commented to 14ymedio on condition of anonymity. In other more sensitive careers such as medicine or teaching many young people have managed to enter with average grades and very low scores on entrance exams, because of the country’s urgent need for doctors and teachers, the first to sustain the government’s profitable business of selling their services abroad on the so-called “medical missions,” and the second to cover the deficit of teachers. These new measures is going to be applied after the last Congress of the Cuban Journalists Union (UPEC) and on the eve of a Press Law still to be enacted.